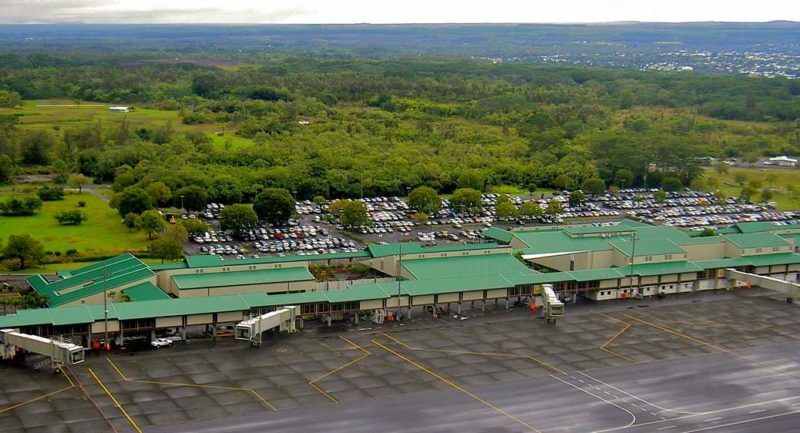 The Hilo International Airport (ITO) is one of the two major airports on the Big Island. It serves most of East Hawaiʻi, including the districts of Hilo and Puna, as well as portions of the districts of Hāmākua and Kaʻū. The other major airport on the Big Island is KOA, 8 miles above Kailua-Kona on the West coast. Most flights to the airport come from within Hawaii. Hawaiian Airlines and go! Mokulele fly to Hilo from Honolulu International Airport (HNL), and United Airlines serves ITO from Los Angeles and San Francisco. Read more about flights to Hilo from the mainland and inter-island flight to Hilo. 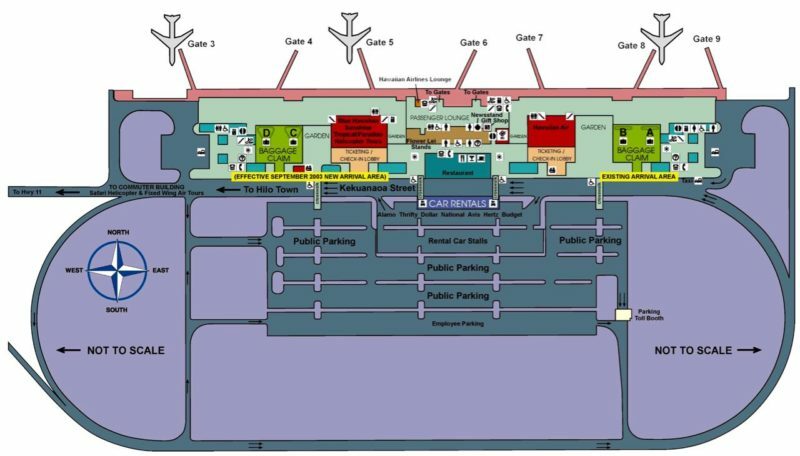 Map of the terminals at the Hilo airport. Image source: hawaii.gov. A good strategy to get the most out of your time on the Big Island is to fly to Hilo but leave from Kona. This will allow you to see a lot of the Big Island and save you half a day on your itinerary and some rental-car-return related stress. You can find the official website of the Hilo International Airport here. It is pretty straightforward to get your trip going once you arrive to the airport. You have the choice to leave by taxi, by bus, or with a rental car. Getting your rental car at the Hilo airport is easy. Most big rental agencies, as well as some local ventures, are present just outside the arrival hall. The local companies often offer the best rates. It is also possible to take the public bus service from the airport to the bus terminal in central Hilo, with about 8 buses a day Monday through Saturday. For more information go to the hele-on website. There are also many taxi cab companies that service Hilo airport. You can find taxis at the designated exclusive taxi lane for queuing in front of the Baggage Claim Area. Approximate taxi rates are $3.00 flip + $.30 per 1/8th mile + $.30 per minute for waiting time + $1.00 per bag. Waiting time is charged when passengers need to make stops prior to reaching their final destination. The information above has been summarized from the “ground transportation” section on the official Hilo Airport website. Why is Hilo International Airport called ‘ITO’? If you are flying to Hilo international airport the baggage tag on your bags will read ‘ITO’. This three letter code is called the IATA airport code (International Airport Transportation Association). For most airports around the world this code very closely resembles its airport (such as KOA (Kona) and HNL (Honolulu)), but not for Hilo! Hilo Airport was called ITO after one of the first Hawaiian Airlines Hilo Airport station managers: “Mr. Ito”. The airport was called ITO because both HIL (Shillavo Airport in Ethiopia) and ILO (Mandurriao Airport in Iloilo,Philippines) were already taken. ITO also sounds a lot like Hilo. 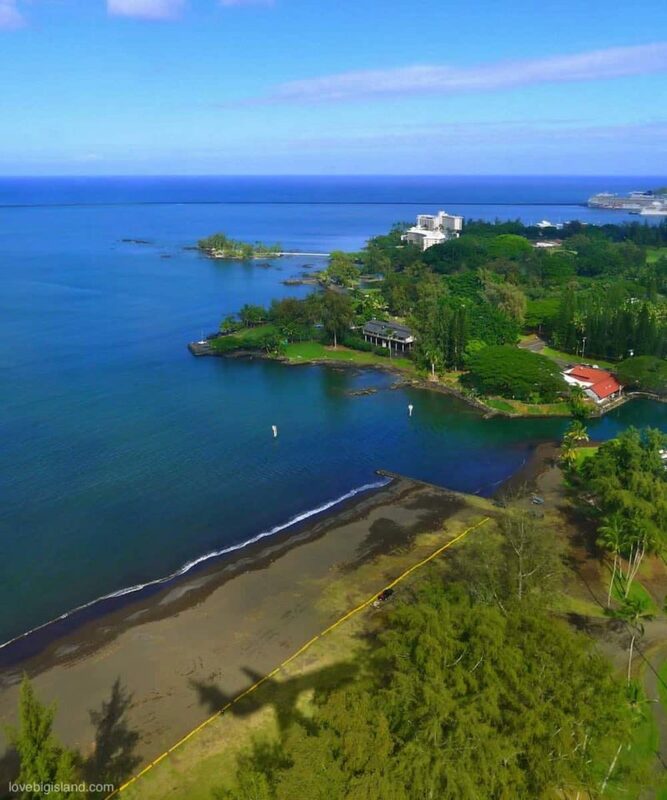 Hilo was designated ITO because in the first half of the twentieth century, residents of the Big Island of Hawaii referred to the City of Hilo as Hilo Town, thus HIlo TOwn being the closest city or town to the airport.